That title in itself send my sensory issues overboard and my head spinning. 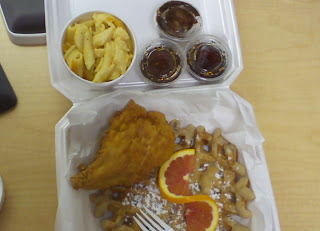 There is a new place close to my office called "Dame's Chicken & Waffles" in downtown Durham. They are having their soft opening right now and I went in to get a check on how things are. The menu in our office had a lot of items that sound out-of-control-good. They also have a good variety of "schmere's" and butters that sound really great too. I got the "Classy Hen", and it was definitely one of the more simple items on the menu. It was a choice of a fried or grilled boneless chicken breast, a side (mac & cheese, greens, or grits), and waffle. It was beautifully presented, even in my to-go box. I snuck a peak at everyone's meals in the restaurant and it definitely looked promising. With a sweet tea it came out to $11.97. Way over priced for the product. Bring it down to $8 (without drink) and I'm definitely on board. The waffle was a good size, and amazing. It had a great tinge of cinnamon or clove. The chicken was fresh out of the fryer and was good also, but had an unexpected spiciness to it (but it certainly didn't keep me from devouring the whole thing!). I know the waffle and syrup are supposed to pair well with it as a bite together with the chicken, but it's just not my thing, and I just preferred to eat it separate. The syrup was yummy, as well as the chocolate hazelnut spread that I substituted for the usual almond that it came with. The guys running it were very nice and eager to make sure I got everything I needed. I'm looking forward to their grand opening on August 24th. Their extended menu looked great and I'm excited to try their salads and sandwiches. The decor was very pretty. It's definitely got some of the historic downtown Durham appeal inside with some beautiful architecture, and it's painted different shades of brown with soft blue accents. It definitely made me want to go home and paint my house. I think the place will definitely do well once they have a full menu and lower their prices. Here's to hoping they stay open, and then have a breakfast menu with their delicious waffles and some bacon! Good luck Dame's! Hope it goes well for you!